What a fun Sketch Challenge this week at Splitcoast! For my card I used this gorgeous set from ODBD called Fragrance. I colored the roses with copics and then did some fussy cutting. The designer paper strips are from the ODBD Shabby Rose Collection. I also used ODBD Pierced Rectangles, Pierced Circles and Doily dies. I finished the card with three little pearls! Sketch Challenge #650, Mr. & Mrs. This is for this week's SC650 at Splitcoast. I added the bottom right partial doily to give a little balance to my card. 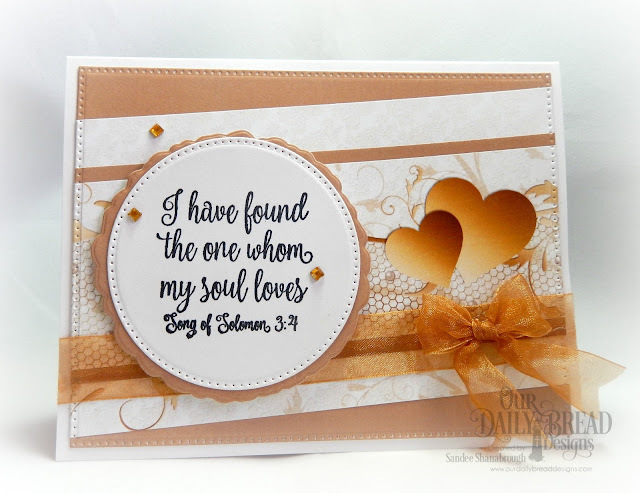 This lovely image and the sentiment are from the Long Lasting Love set from Our Daily Bread Designs. I colored the cake with copics and fussy cut. I made the frame with Pierced Rectangles. The partial doilies and the circle under the frame and cake are both cut with the Doily dies. 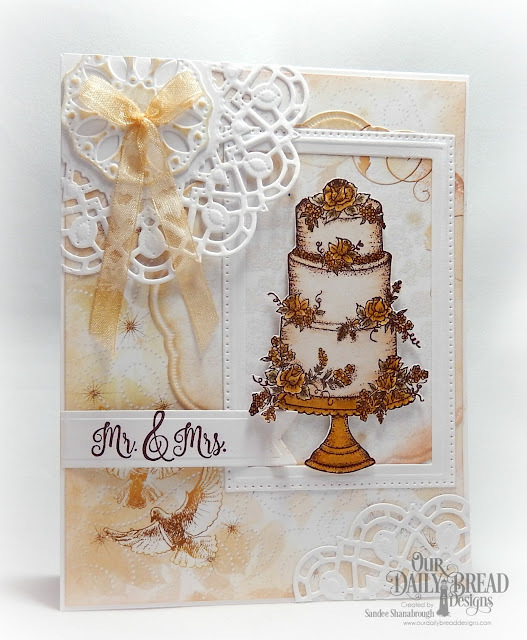 The sentiment is cut out with a Pennant Flag and the designer paper is from the Wedding Wishes Collection. A little sponging and a pretty bow completes the card. 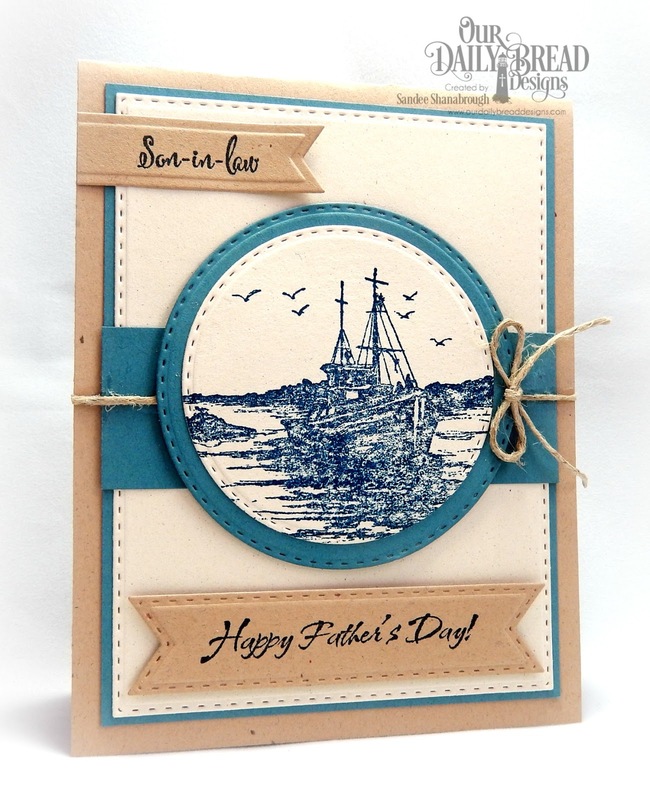 Here is a quick card I made for the F4A382 Challenge and SCS to make a masculine card and add twine. I REALLY struggle with masculine cards y'all. I have used two stamp sets, The Waves on the Sea and To My Favorite. The dies I used are: Double Stitched Rectangles, Double Stitched Circles, Double Stitched Pennant Flags, and Pennant Flags. The twine was the finishing touch! Thank you so much for stopping by today! 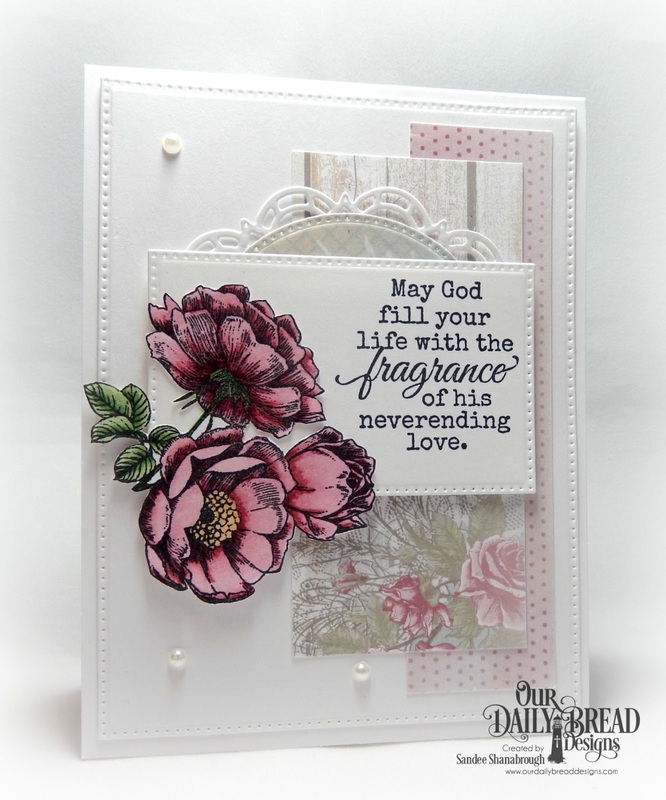 We are enjoying this June Release from Our Daily Bread Designs so much! 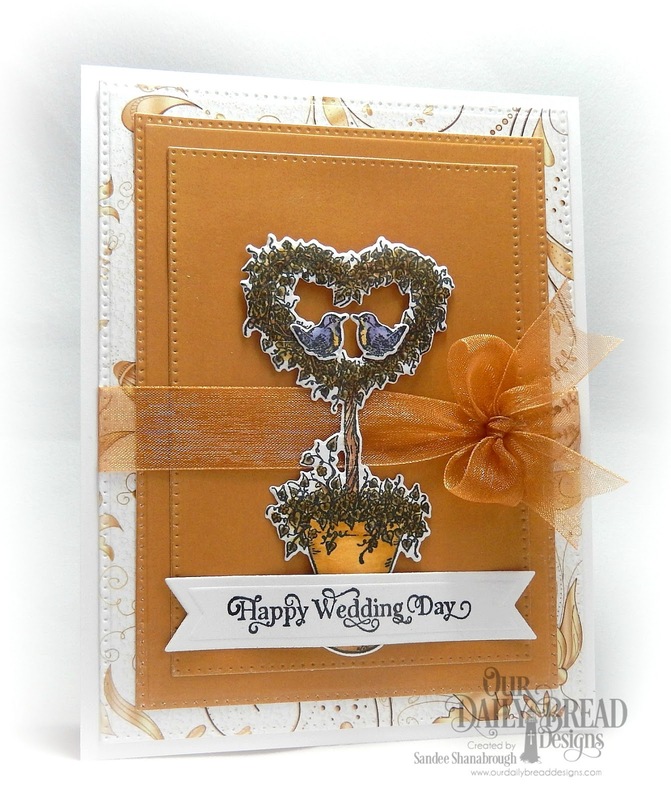 Making wonderful wedding and anniversary cards is a cinch with ODBD stamps, dies and papers! For my card today, I used the wonderful scripture which is in the Happy Wedding Day set and cut it out with an Ornate Oval. I cut out the 50 with the Large Numbers dies and then popped up the numbers and the sentiment oval over a frame made with Squares and Layered Lacey Squares. That gorgeous designer paper is from the Wedding Wishes Paper Collection and is cut out with a Pierced Rectangle. I added a Beautiful Border and a pretty bow. And tucked in a few flowers cut with Bitty Blossoms and Leaves and Branches. Thanks and have a beautiful day! Hello and Happy Sketch Challenge Day! For today's sketch, I have used the new set from ODBD called Happily Ever After. I cut out the scripture with a Pierced Circle and matted it with the largest of the Zinnia and Leaves dies. The beautiful designer papers are from the Wedding Wishes Paper Collection and are cut out with a Pierced Rectangle. I added the beautiful ribbon ad a few rhinestones to complete this quick and easy card! It's Sketch Challenge day at Splitcoast! 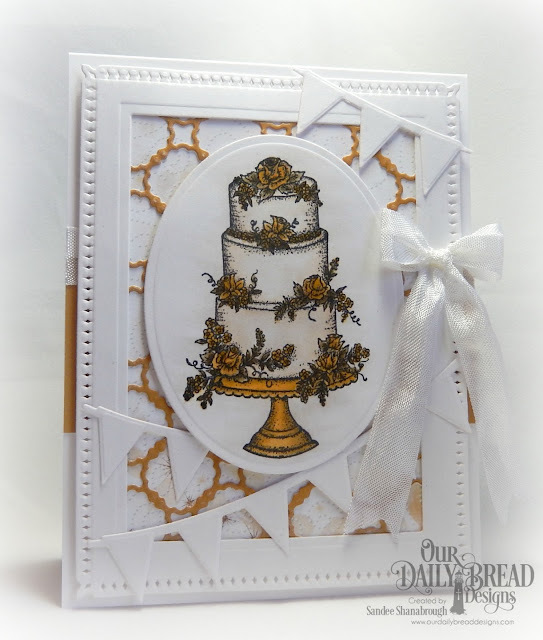 For the sketch today, I have used new goodies from Our Daily Bread Designs. I replaced the circle with this wonderful topiary from the set called Happy Wedding Day, which has a coordinating Heart Topiary Die! Those little birds are sooo cute! The images were all colored with copics before cutting out. Then I cut out three panels from the new Wedding Wishes Paper with Pierced Rectangles. I added a pretty bow. I stamped the sentiment and cut it out with a Pennant Flag. The final touch was adding highlights on the topiary with gold Wink of Stella. As soon as I saw the Ways to Use It Challenge at Splitcoast this morning, I zoomed through my chores so I could make a card with pearls! While June is the month for pearl birthstones, June is also the month for weddings! The new sets from ODBD just came out today and they are all about weddings! You can see my blog hop cards HERE! For this card I used the new set called Happily Ever After. 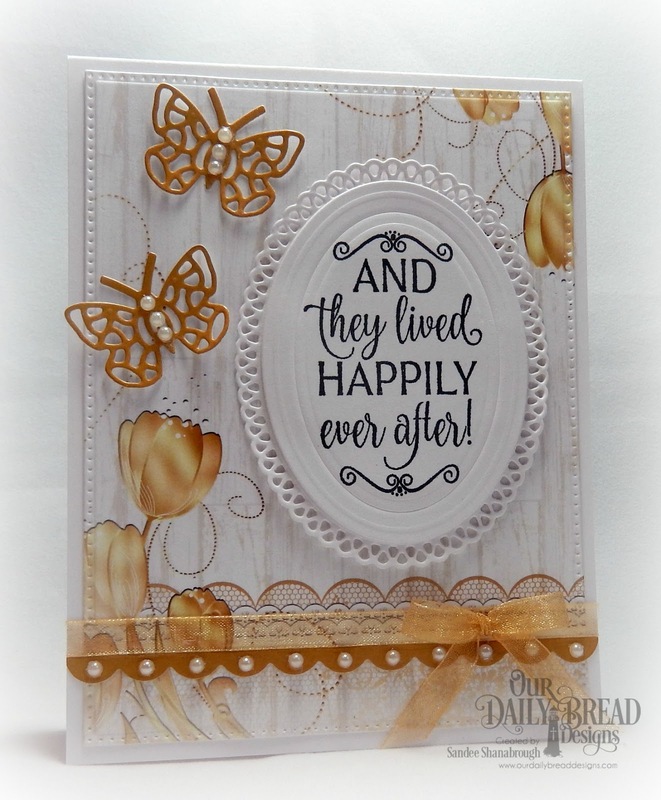 I cut and embossed the sentiment with ODBD Ovals and layered it over an Ornate Oval. The gorgeous paper is from the new Wedding Wishes Collection and is cut out with a Pierced Rectangles die. I added a Bitty Border and some Bitty Butterflies and lots of tiny pearls! Actually a quick and easy card! Don't forget about the ODBD June Release Hop! Welcome to the ODBD June 2017 Release! We are so happy you have joined us for the ODBD June Release Blog Hop! This month is all about weddings! I love this image from Happy Wedding Day! And there is a handy Heart Topiary die to match!! I colored the topiary with copics and cut it out. And those little birds! So cute! 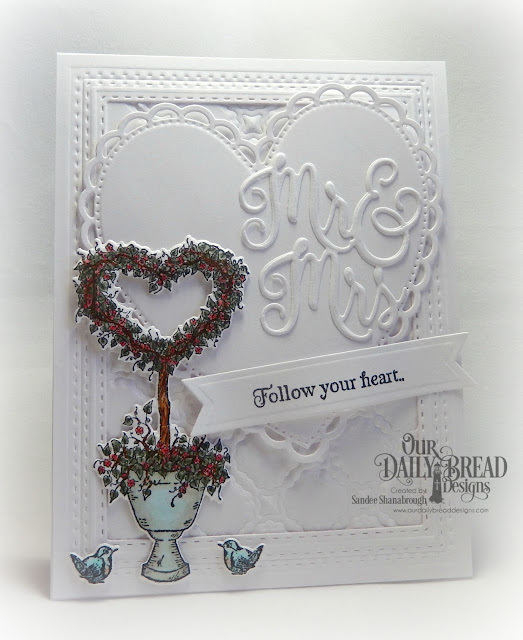 The new Mr & Mrs die cut is so pretty inside the Ornate Heart. The frame is made with Double Stitched Rectangles with the new Scalloped Chain embossed panel as the background. The sentiment is on a Pennant Flag. I added clear Wink of Stella her and there for a little sparkle. This image is so elegant and beautiful! It is called Long Lasting Love. I used the gold paper from the new Wedding Wishes Paper collection as my color inspiration. I cut out the cake with the largest Oval die and popped it up over the framed layer. I made the frame with the largest Snowflake Sky die and a Rectangle die. The background of the frame is done with the Wedding Wishes paper and the new Scalloped Chain die. I added a few Pennant Rows, a pretty seam binding bow and a few touches of clear Wink of Stella to complete the card. For your chance to win, follow the links below and make comments! Thanks for being here! Have a wonderful day!